For a student, the difficulty of physics is perhaps easier to explain: the ways of constructing meaning are challenging, the models of knowledge demand careful study for mastery, and the assessments are notoriously hard to bluff your way through. For educators, however, these difficulties are part of the trade. Textbooks, lesson plans, and pedagogical approaches provide good ways for students to overcome these issues. Even as an educator, however, IB physics still seems hard. Some people believe that the syllabus is too broad, encompassing too many topics like particle physics, wave interference, thermodynamics, and the greenhouse effect. Others point to the depth of understanding required to score well on the exams. However, I don’t think that either of these dimensions is sufficient to explain what is so hard about the syllabus. I’ve added a third dimension to the “iceberg” of physics. Thickness is about the skills students need to acquire in order to do physics. To see this, let’s look at some examples. Example 1: There’s a car on a hill, with lots of known properties. Depth – what is the car’s velocity at the bottom of the hill? what is the efficiency of the car’s motion? if the car were to roll back up a similar hill, how far would it go? Breadth – what would be the impact of a non-zero drag force? how does the calculation change if you consider the angular momentum of the wheels? at what rate is the car increasing the temperature of the hill? Thickness – how do we know to use energy conservation? what does our model include? how can we understand the energy transformations within this model? how do we know if our answer is reasonable? In this problem, students are expected to use the Rayleigh criterion to estimate resolution. It is a simple calculation that they have already done a few times, using a formula from the data booklet. This topic demonstrates both the breadth and depth (this is from a unit on single-slit interference) of the IB physics curriculum. It also demonstrates thickness: conceptually understanding what is going on here is very challenging. Although this appears on an exam, I suspect most IB physics students have just memorized how to use the formula. Thickness in physics involves the skills, approaches, mindsets, and contextual knowledge that allows physicists to do physics. This includes things like critical thinking, building models, visualizing phenomena, drawing representative diagrams, working fluently with numbers, dimensional analysis, and using the right model at the right time. IB Physics is hard because we neglect the thickness of physics, focusing on solving standard problems and preparing for tests instead of learning the skills of physics. And when students do well in this hard course, it isn’t because they mastered physics: it is because they did well on the test. Let’s return to the tweet by @AfroRose_: “I remember when I was in IB physics, it was so hard. What’s crazy was in class I always got the answers right, but I couldn’t explain myself [emphasis added]”. Here is a student who studied hard and succeeded at IB physics, but never became competent with the skills involved in the discipline itself. For her, physics was deep, broad, and thin. Over the past two years, I have tried to reconcile a deep, narrow, thick pedagogy (Modeling instruction) with a deep, broad, thin syllabus. There have been productive moments — the thickness is especially valuable in preparing students for their independent investigations — but any concession toward thick teaching comes at a cost in contact hours and, since the alternative is to prepare students directly for their exams, potentially a decrease in student grades. How can IB Physics be more thick? The AP and A-level boards have both done an admirable job in their past revision cycles of cutting down the amount of material students need to learn, that is, decreasing the breadth. The IB revision cycle sort-of-not-really did this, by reducing the number of optional topics, and shoehorning some extra particle physics into its place. A decrease in breadth is necessary because of the limited amount of time available for learning. With a bit more time allowed for the development of skills with mechanics, for example, we could include system schemata, LOL diagrams, or graphical vector addition for forces. If we keep Feynman diagrams, we could have enough time to develop students’ understanding of them. With scaffolds like these, we could be confident that students will be better prepared to tackle unfamiliar, complex problems on exams. This could even allow for the use of open-ended problems. I think that would be pretty cool. A change to a syllabus that seems to make it less hard will always be met with concern. I want to smart-up students, not dumb-down the curriculum. In any case, I wouldn’t be worried about blowback. I gave my dad my IB Physics test and two hours later he solved one problem. This entry was posted in Uncategorized and tagged hard, ib physics, modphys, thickness on April 3, 2016 by Danny. In applying the modeling methodology to IBDP physics, there are a few gaps. In this post, I present a unit that uses the modeling approach for the thermal physics and thermodynamics unit of Physics. For this lab, masses of hot and cold water are mixed in an insulated cup. After a demonstration of the effect, students should walk through a variable brainstorming session (I like a version I learned from Karl Schmidt that has three steps: observations, measure-ables, manipulate-ables). The students should recognize that either the hot water mass or the cold water mass could serve as the independent variable. They will recognize that the temperatures are dependent, but might need some help to decide to use the ratio of temperature changes as the dependent variable. The students will thus conduct two labs, perhaps by splitting into two groups and sharing in the whiteboard meeting. They should find that the ratio of temperature changes is proportional to one of the masses and inversely proportional to the other. Be careful to define the ratio of temperature changes clearly for everyone before beginning data collection. Now, the students should recognize that this reflects the heat flow discussed earlier, but since heat is n energy change the units don’t work out and we need to have a coefficient. Students should think about what this coefficient means (it is the energy released/absorbed to change the temperature by one degree Celcius for each kilogram of matter). 3. Some practice with calorimetry problems without phase changes here. I spontaneously put two on the board at the front, and had student pairs write a third. 4. Demonstrate a melting curve. This may be difficult, but at least set up the apparatus and sketch the resulting curve. First provide students with the power output of the heater and the mass of your sample and ask them to find the specific heat capacity of the sample (ie: using the slope). Next, point to a segment where the temperature is unchanging and ask students to try to explain what is happening here. Socratic questioning and your favourite applet (PhET, etc) is good here. There are lots of misconceptions here, so insist on very clear statements and model IB language (ie: from past exams). Students can usually guess the form of the latent heat equation (Q=mL), so I ask them how they would design an experiment to test that, and then we move on. 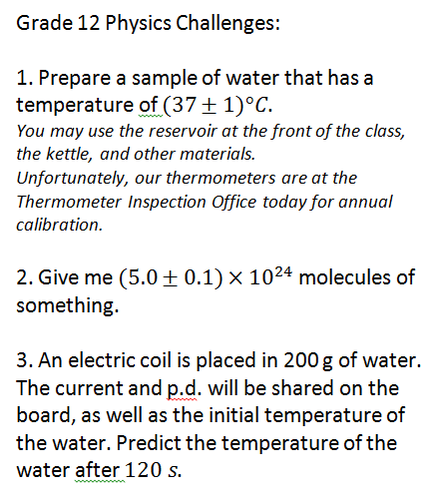 Now, the students are ready for some lengthier calorimetry problems, so they do a worksheet of these. A quiz based on the worksheet. I do a calorimetry problem at the front of the room, moving a hidden mass of steel from a hot water bath to a known mass of cold water. I provide the temperatures and the students predict the mass, which we put on a balance once all the predictions are in. How does a changing temperature affect the pressure at constant volume? How does a changing temperature affect the volume, when the volume is adjusted (ie: by extending the syringe) so that the pressure is constant? Connecting these gives that PV/T = constant. Logically, P and V should be proportional to the number of moles n, while T is inversely proportional to n (at constant P and V), so this becomes PV/T = nR, where R is the ideal gas constant. After rearranging this equation into the familiar form (PV=nRT), as students to determine the units on the left side. This gives the units of R as J/mol/K and, more importantly, shows that the ideal gas law is fundamentally a statement about the amount of internal energy in the gas. A brief note about the Maxwell distribution and rms velocities of the particles is probably appropriate here, even though it does take us out of the modeling cycle. Now, the students do a second worksheet, on the ideal gas law. This also includes the three constituent laws (Boyle’s, Charles’, and the Gay-Lussac/Amonton) and practice with the exam-style question “determine whether this graph shows that the gas obeys Boyle’s Law (etc)” by checking points on the graph to determine whether the relationship is proportional, inverse, or otherwise. This entry was posted in Uncategorized and tagged ib physics, modeling, thermal physics, thermodynamics on November 16, 2015 by Danny. 1. Two “design” labs. For these, students are given some commonplace material and instructed to investigate it. Students are given not further guidance, are expected to come up with a valid experiment, and need not actually collect any data. The assessment requires that the relevant variables are manipulated and controlled, and that the design allows for the collection of useful data. Typically we give students 5-6 tries over the course of two years. 2. Two “data” labs. For these, students conduct standard experiments with however much guidance they require. For these, the assessment looks at data manipulation (linearization of some sort is required) and presentation, and attempts to evaluate students’ reflection and understanding of the lab. Again, we usually do 5-6, and pick the best two to four. 3. The rest of the grade comes from an unaccountable assessment of students’ lab skills, and from their work on an interdisciplinary project. I was able to put the pig to quick work as a design lab. The class decided to look at how the string length affects the radius of circular motion while the pig is in stable flight. I’m looking forward to seeing the labs (but of course no results) next week. The pig comes with a tether that is approximately 82 cm long. This seems optimal, in terms of establishing stable flight. Shorter lengths had a lot of side-to-side oscillation. We also saw that ground effects are significant, as the pig cannot establish level flight less than a metre above the ground. We also saw that mounting structures could resonate in a way that interferes with stable flight. 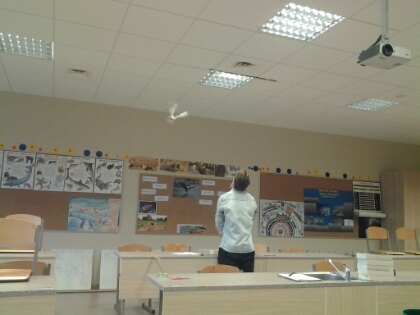 This entry was posted in Uncategorized and tagged design lab, flying pig, ib physics on September 9, 2014 by Danny. This week I was delighted by the arrival of my first-ever Printed Circuit Boards [PCBs]. I will be using these with my IB physics class. 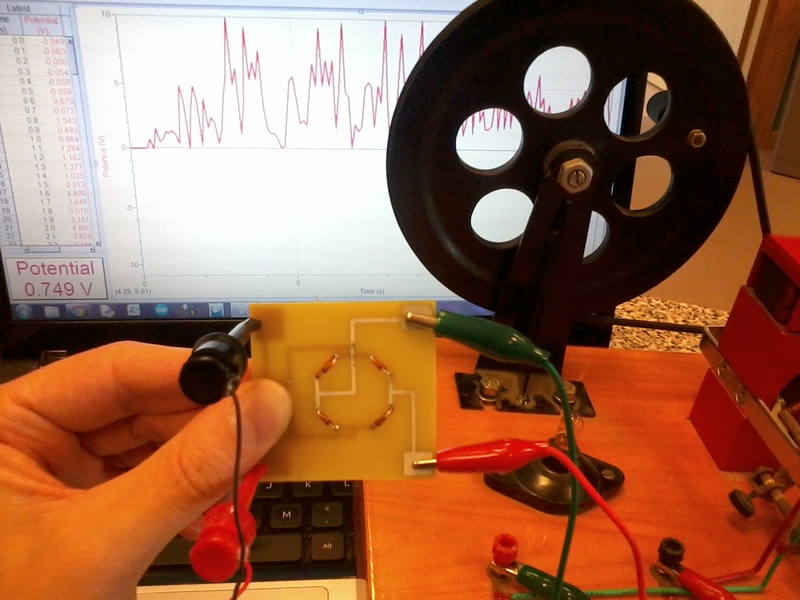 The recent revision of the curriculum requires that students understand the functioning of a diode rectifier. I think it’s a great opportunity to teach some soldering skills, so I designed a little circuit board the students could assemble, and then use for a bit of lab work. The circuit board is at the bottom of the above picture. As you can see, the layout is spacious so that sloppy soldering won’t ruin everything. I also included through-holes so that a capacitor and a resistor can be added, in case we want to use a power supply with a bit of bite. However, I think I’ll stick with the hand-cranked generator, in the picture above, which delivers AC up (and down) to about 10 Volts. 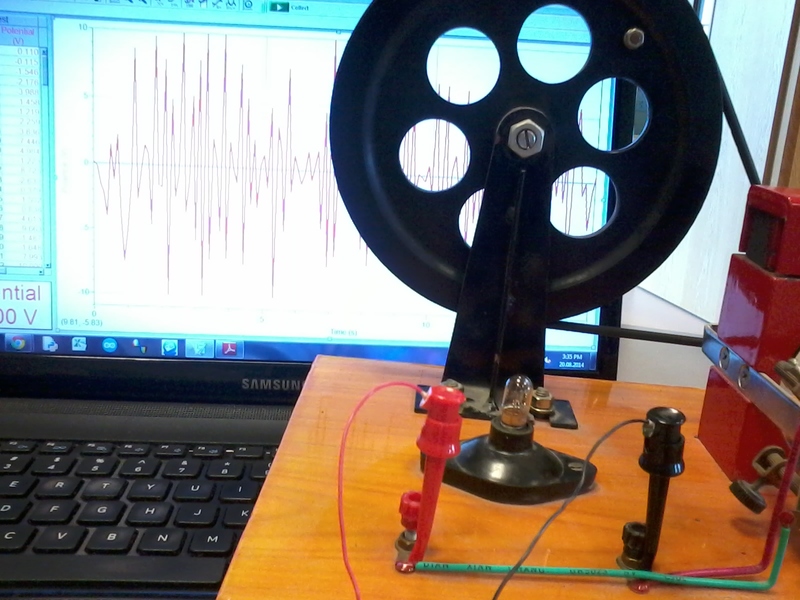 I am using a Vernier voltage probe to monitor the electric potential. You can see the voltage plotted against time (for 30 seconds) on the computer screen above. Below is the same set-up, but using the diode rectifier. Yahoo, it works! 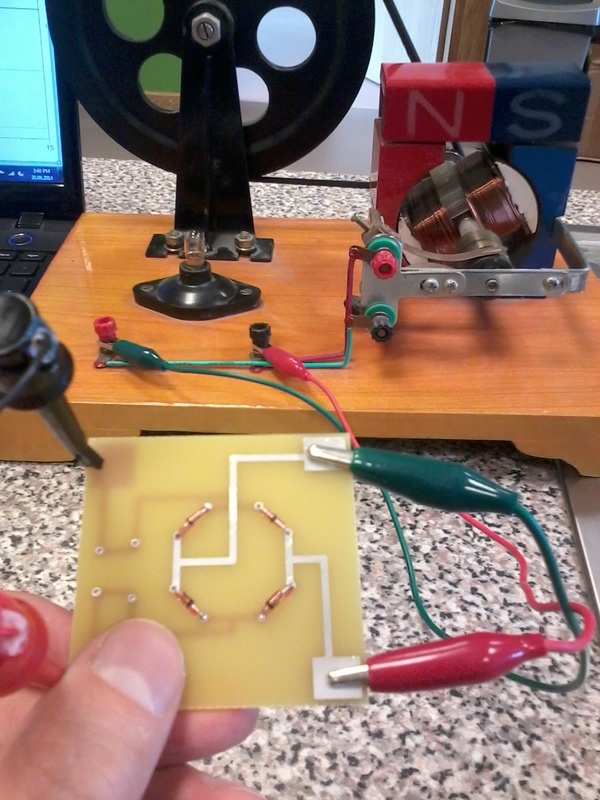 This entry was posted in Uncategorized and tagged diode rectifier, electronics, ib physics, pcb on August 20, 2014 by Danny.